We are getting asked more frequently to size and quote solar powered surveillance systems. I thought it might be a good time to talk about this topic and correct some common misconceptions people have about solar power. First, solar, like wireless, should be still viewed as a technology of last resort in most cases. It raises costs, causes aesthetic concerns, creates installation issues, and increases complexity. If you can wire, you should wire. That said, if you have to install a camera in a location where there is no infratructure (power or communications) then wireless and solar may be your best options. Second, you must look at power conservation as much as power generation. The difference between 10 watts and 40 watts is the difference between a small, attractive and cost effective system and a large, ugly, expensive system. Be prepared to make compromises in order to move to a solar powered system. Before I go into the specifics of sizing and configuring a solar powered surveillance system, I wanted to share with you a related story that illustrates my points on a larger scale. Our local school district just undertook what seemed on the face of it to be a great project to install solar at the high school and various elementary schools around town. The project is known as a PPA or Power Purchase Agreement. This is where an installer provides all of the installation of equipment for "free" in exchange for a purchase agreement where the school promises to purchase the power from the panels installed for the next 30 years at a fixed rate. The installer generates power for the school on site and sells it to the school. Surplus power is sold on behalf of the school to the local power utility in order to off set the cost of the solar panels. 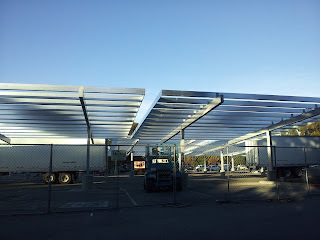 Massive Solar "Carports" being built for "free"
Remember that the school already had grid power and infrastructure. It had built it's consumption based on grid supply. The lights, the computers, the communications systems, etc were all installed without any thought to the limits of being run from solar. So you are now retrofitting a system that was never designed for solar to run from panels. It is a backward way of looking at the problem. My political commentary: The school district didn't have to seek any approvals for the project, since they were not undertaking a capital project, but rather just committing to buy power from a "utility" and all of the equipment was "free". Of course "free" means that it is paid for by tax incentives, credits, and other direct government subsidies that come from agencies hidden from public scrutiny. The cost of the project to the school district is $14 million over the life of the contract which is reflected as electricity costs. But as an operating expense, it did not require any review. The entire viability of the project is dependent on reverse metering sales of electricity back to the local power utility at rates assumed to be much higher than today. If the market stays flat or competition from other schools doing the same thing heats up, then they could lose millions, or have to take draconian measures to conserve energy in order to make ends meet. This also does not figure in the increased consumption that more computers in the classroom would required or depletion in solar cell efficiencies over time (in other words in the outer years, when you expect to have the most net benefit, the solar panels are their least efficient). And of course the actual cost to the tax payer of the project is much higher than "free". The subsidies incurred for the project can run as much as 70% of the capital equipment costs. But since the subsidies are paid out of different government budgets than the schools it is impossible to hold anyone accountable to pull the spider web in. So we as tax payers are really overpaying for power by about $9.8 million and taking a large risk that the school will run out of capacity in later years. Solar makes sense if you design for solar from the start, avoid inversion (converting from DC to AC), use power efficient equipment, and plan for capacity growth in the future. My main point from the story above is: when undertaking a solar project, plan for solar. Pick your cameras with power consumption in mind, pick your wireless routers with power consumption in mind, pick your storage solution with power consumption in mind, then size your solar system to fit the need. Lets start with a simple perimeter parking lot camera. This camera is remote from any power or communication and needs to use long distance (2km) wireless and solar. There is a requirement for good facial detail, for criminal prosecution, and we need always on situational awareness. Normally, a security installer might pick a PTZ camera in an outdoor speed dome with a heater blower and a wireless router for an application like this. But that configuration might be 40 to 50 watts per hour. You have to run your system 24 hours a day, so that means that you need to make 960 watts per day. In most parts of the lower 48 states you have about 4 hours that you can charge, so you need to make about 240 watts per hour, just to run your equipment. But then you also have to allow for batteries to run when the sun doesn't shine. Let's allow for 3 dark days, which is generally accepted industry standard, so you need to make 3x240 watts per hour or 720 watts per hour. That is a lot of power and a lot of panels. If you used 135 watt panels that are 2 feet x 4 feet you need 6 panels. Then we also need a battery, battery box and charge controller. One of the most overlooked elements of solar installations is the mounting of the panels. If you use a light pole you need to make sure that the pole can handle the wind loading of the panels and carry the weight of the battery box. You may need to reinforce the foundation of the pole by pouring a concrete pad. This all adds up to additional expense. Now, if we design for solar, we can use a 3 megapixel camera with electronic PTZ and no heater/blower. The total power for such as system with a HauteSpot WRAP wireless router is less than 10 watts. That means we only need 2 panels for the same application. If we can make do with only two dark days, then we are down to one panel. If you design the system for low power consumption, then you can size the power generation for small scale too. Now, say you have to go way off the beaten path. You want to put your camera where you only have 3G cellular, but you need live real time streaming, you want high definition so you can see who is causing trouble. Using conventional thinking you might use a PIR motion detector to trigger the camera to come on for a short time, transmit its video and then turn off again. The problem is that you only get low resolution and you only get it for a short time. Try now running a microNVR with the same low power camera and a 3G modem. Again, at less than 12 watts total, you could run this solution all day on two panels. The microNVR can record at high resolution 24x7 and using transcoding software we can send high quality, high frame rate video for situational awareness over 3G. After a few people read my blog they told me: "Well you had a great backswing, but no follow through." They meant that I stated all the problems but skimped on the solutions. Going back to the school example. If the high school had undertaken a comprehensive solar implementation project, that looked at consumption as much as supply, they could have come close to an economically viable implementation of solar. If they had rewired lighting circuits to use 24VDC and swapped out AC incandescent and flouresent lights with LEDs. If they converted all of their heating systems to natural gas. If they had replaced AC blowers with DC blowers. 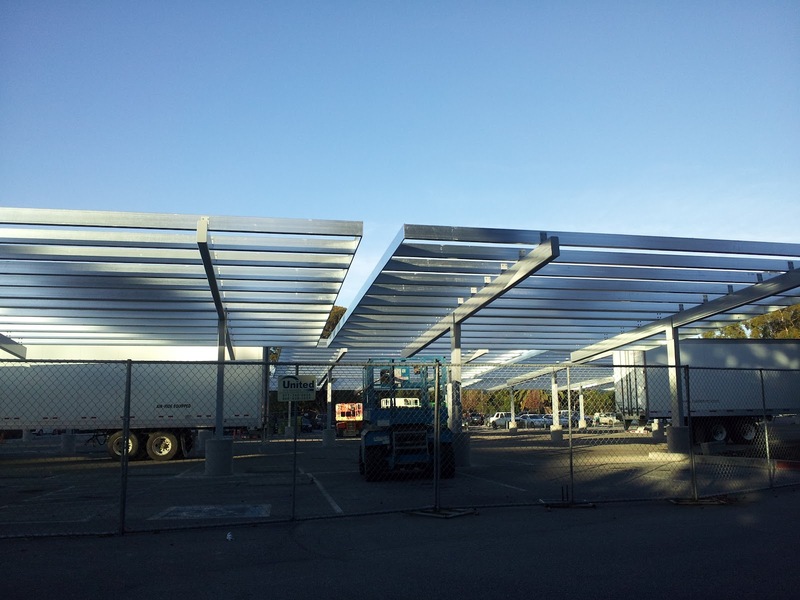 Then they could have gotten their consumption down to where smaller panels could have been mounted on the roof, saving the costs of building the carports. They could have eliminated inversion, which would have saved them about 15% in power loss for conversion, which again means fewer panels and less cost. 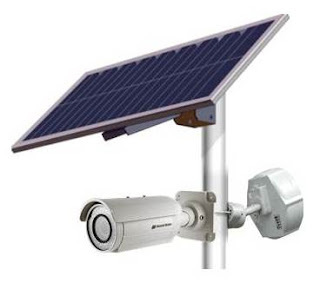 Now look at building a solar powered surveillance system: Conventional assumptions say to use a PTZ camera: 20-30W. Install a heater/blower: 10-15W. Use a mesh wireless router: 15-20W. Maybe you pick an DC heater/blower, but it is less expensive to use 24VAC, so you need to invert the power from DC to AC with a sine wave converter: 15-20% loss. If we use a 3 megapixel camera such as a Vivotek FE8171V, a AXIS M3114-VE, a Mobotix Q24, or other camera that allows for electronic steering of a VGA window within the fisheye field of view, you can achieve PTZ performance for less than 4W. With a lens heat ring, you can keep the power for defogging and defrosting the lens down to less than 4W. And by using a HauteSpot wireless router, you can keep your long range transmission power down to less than 6W. Conventional thinking without redesigning your system for solar could consume 65W (this is actually based on a project that we had a customer install). They ended up using our routers instead of a competitor, so they could knock about 20W off their budget, but they still had to file building plans and get permits. They excavated for pads, then formed reinforcement, then poured concrete. They installed large frames for the panels, large boxes for batteries, and had to ship all the heavy material to the site. The project took months to complete and cost hundreds of thousands of dollars for the 20 cameras. If they had started with a design for solar by calling us first, we could have saved them months of time, hundreds of thousands of dollars, and made a system that looked much nicer. Because of situations like these, we have built up our expertise in solar system design and sizing. We work with partners who know how to install solar, and we have found partner suppliers who have the right products at the right price. Again, you need to design a system, not bolt on panels to a system that was never intended for solar. I like so much your article about solar system and thanks for sharing wonderful article.